An engineer has a few tasks to perform when it comes to working with Lambda -- writing the code, packaging it for deployment, and finally monitoring its execution and fine-tuning. We're going to look at basic packaging and deployment with the aws cli. for executing the function on our behalf. Each function can be invoked from the command line, with the event data passed in from a local file. Currently this simply checks whether the EXPECTED string is present. checks on the contents of SITE. # Source the bad IPs from the SANS service. Description: Backend for photo sharing reference architecture. 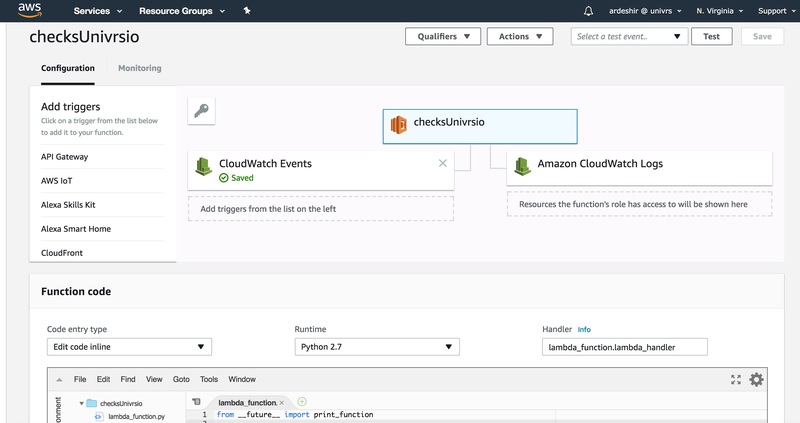 S3 event trigger to invoke the start step function Lambda function. Description: Calls DescribeExecution on a state machine execution. Description: Extract image metadata such as format, size, geolocation, etc. \ }\n      ],\n      \"End\": true\n    }\n  }\n}"